The Girl Who Chased The Moon is a "sweet" book. It is a light and quick read with a magical touch, just as Ms. Allen's other books. I enjoyed reading this book, and looked forward to it, but in the end, I don't think I got much out of it. 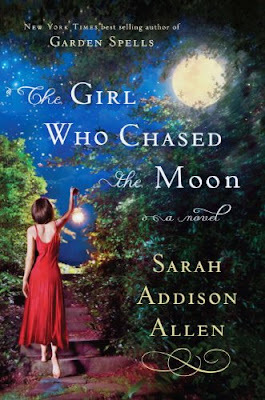 I dreaded writing this review because I really loved her first novel, Garden Spells. But, after thinking about it long and hard, I am just a different reader now than I was then. This was a nice story, but for most of it I felt like I was reading an episode of Wizards of Waverly Place. This is not necessarily a bad thing, but I don't think I am the target audience. This would make a great young adult read (although there is some romantic scenes in there towards the end). I know that this is a wishy washy review..... I liked it but I didn't love it, even though I felt I should love it and I wanted to love it. However, I would recommend it to those of you who want a light and sweet, feel-good read. the cover of this book is so beautiful and the story seems interesting. interesting, I search that one!